Outlaw Big Tire No Prep Drag Racing at Ozak Raceway Park!! Take a look at this, Outlaw Big Tire No Prep Drag Racing at Ozak Raceway Park!! It seems that there have been some disagreements about the tittle of the video, and the fact is pretty simple, the word “Street” is not in the tittle so what you are about to see, are not street cars, just some big tire no prep racers, which are extremely fast. Now that we explained this, let us explain that, yes, most of the cars you are about to see are Pro Mods and we do not need to explain the rules and tell you to what extend those are allowed to be modified. The second issue that some have talked about is that at the Meltdown event, the track at Ozark Raceway Park has been prepped before this race, but that is not up to us to judge, there are folks that organized this, and racers that showed up and raced, so let’s just play the video and enjoy some real drag racing with some very fast cars. 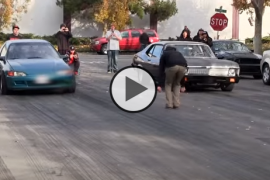 K20 Civic vs LSX Chevy Nova vs Camaro!! 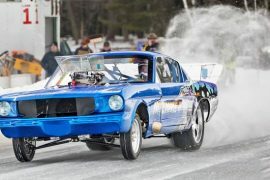 They Use a Frozen LAKE as a DRAG STRIP! Insane! Keanu Reeves Shows Us His Most Prized Motorcycles !! Previous article1972 Pro Street Chevy Vega Fresh Start Up after Rebuilt!! Next articleNorth Carolina No Prep Drivers Battle for $7,500!!! 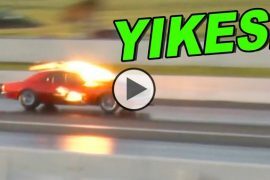 Fireball Camaro vs Blown Camaro at Memphis Street Outlaws One Hell of a Race!